A new patent application filed this week by Apple suggests the iPhone maker is looking to use the device's accelerometer to detect possible theft of the hardware. 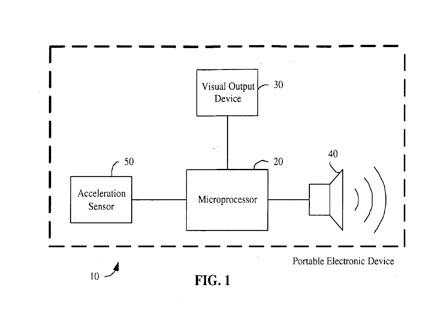 In a application entitled "Acceleration-Based Theft Detection System for Portable Electronic Devices," Apple describes a system that would analyze movement via a device's accelerometer to determine whether a theft is present. If the system were to interpret fast movement as a theft, it would initiate an alarm. "The drive toward miniaturization of electronics has resulted in computer-based systems that are becoming much more portable," the application reads. "Current portable electronic devices such as laptop computers, hand-held devices such as cellular telephones and personal media devices, such as the iPod from Apple Computer, Inc., and even devices such as compact disc players, are sufficiently compact and lightweight as to make them easily movable. Unfortunately, such ease of transport also implies ease of theft. While the rightful owner of a portable electronic device may conveniently transport it almost anywhere, so can a thief. " It goes on to say that traditional theft-prevention methods like mechanical locks are bulky and tether the device, eliminating portability and convenience. In the proposed system, the accelerometer would be used to determine whether the device is currently in a likely theft condition. "Typically, theft or other large-scale movement of the device results in an acceleration signal having characteristics different from other events such as shock, impact, nearby machinery, etc," the application reads. "The detected acceleration as a function of time is thus analyzed to determine whether it corresponds to such large-scale movement of the device, rather than an innocuous event such as the impact of a book dropped nearby. If so, an alarm is produced in order to alert others to the theft." The described system would have methods to prevent false alarms through "signal conditioning," which could filter out events such as shock or impact associated with an iPhone being dropped. The system would also allow the phone owner to display a "visual warning" for potential would-be thieves. Such a warning would warn potential thieves that the device "has an active theft detection system protecting it." The patent was filed by Apple on May 20, 2009 and is credited to Paul J. Wehrenberg of Palo Alto, Calif.